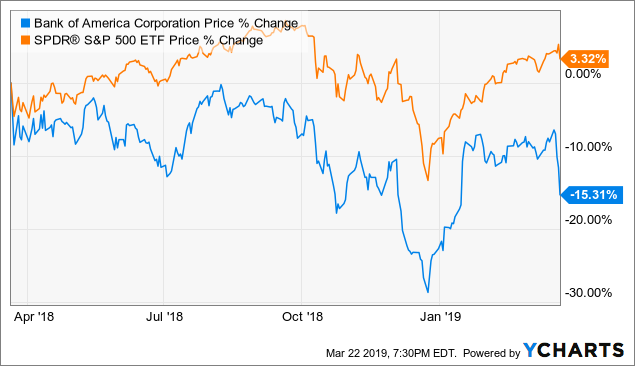 Bank of America’s (BAC) stock has performed well so far in 2019 (up 9%), but BAC shares have significantly underperformed the broader market over the last year. Financials have been under pressure since mid-2018 due largely to industry-specific factors (low interest rate environment, flattening yield curve, and increasing regulatory concerns), but I view the pullback in BAC shares as a great long-term buying opportunity. BAC has a strong bull case, which includes promising capital return prospects, so I believe that there is a lot to like about BAC shares at today’s price. BAC pays a lower-than-average dividend, but it has significant dividend growth prospects. 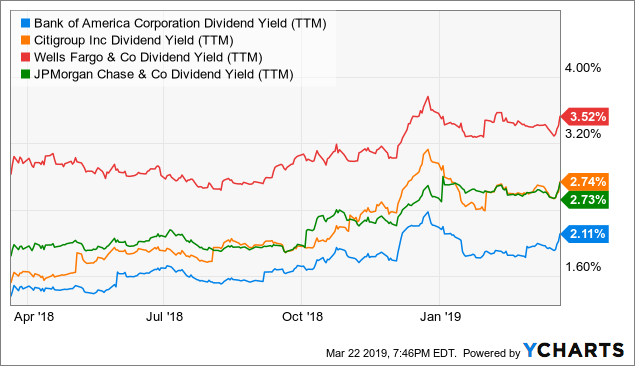 The bank’s yield is slightly above 2%, which is the lowest dividend yield in its peer group – Citigroup (C), Wells Fargo (WFC), and JPMorgan (JPM). Looking back, BAC has materially increased its dividend since the token $0.01 that was paid quarterly for years after the Financial Crisis. The $0.15 quarterly dividend ($0.60 on an annual basis) may not seem like much, but it is a far cry from the $0.05 that was paid only a few short years ago. The bank has a 5-year dividend growth rate of ~72% and, more importantly, management still has the necessary wiggle room for further increases in the years ahead. BAC’s dividend would be approximately 26% higher (~$0.76 on an annual basis), if the bank had an average payout ratio. The bank will first need to receive approval through the Comprehensive Capital Analysis and Review, or CCAR, process to raise its dividend, but, in my opinion, investors should expect for the impressive dividend growth to continue over at least the next two-to-three years. 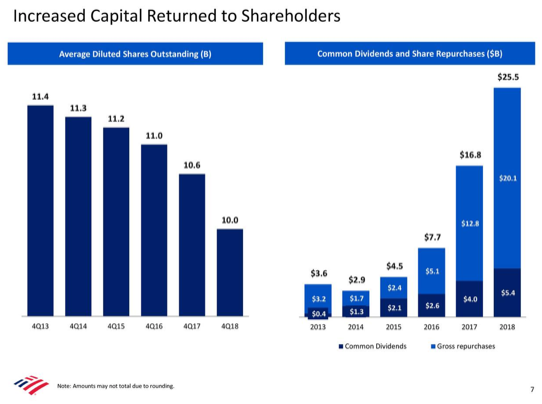 Moreover, let’s not forget that management repurchased $20.1B worth of common stock in 2018 and the board recently increased the buyback program by another $2.5B (expires by June 30, 2019), which means that management is creating additional room for future dividend hikes. To this point, I believe that the chart below says a lot. Any way you slice it, BAC has a great capital return story to tell. And it helps the bull case that the bank has a strong earnings profile and a stock that is attractively valued. On January 16, 2019, BAC reported Q4 2018 results that beat the top- and bottom-line estimates. The bank reported adjusted EPS of $0.70 (beat by $0.07) on revenue of $22.7B (beat by $390M), which also compares favorably to the year-ago quarter. 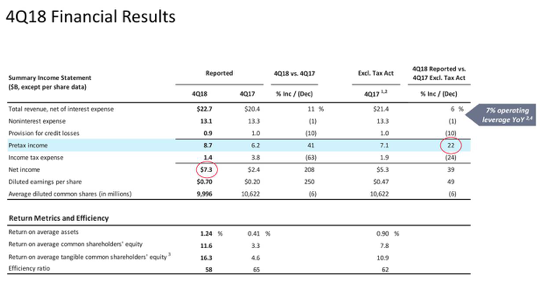 I recently covered the bank’s Q4 2018 operating results here, so I will focus on what really matters, i.e., earnings growth. Over the last five years, BAC’s earnings per share increased from $0.43 to $2.64. Yes, share buybacks are coming into play but also notice the fact that the bank’s net income came in at $28.1B for 2018, which is materially higher than each of the prior four fiscal years. BAC definitely benefited from the tax reform bill in 2018, but this type of growth is impressive, especially in an environment that many pundits labelled as “challenging” for the banks. From a valuation standpoint, BAC shares are trading at attractively levels when compared to the bank’s peer group. Source: Data from the Q4 ’18 Presentations for Citigroup, Wells Fargo, and JPMorgan; table created by author. BAC’s stock is not as cheap as it was a year ago, but I still believe that it has room to run. If BAC traded in line with its closest peers (i.e., Wells and JPMorgan), the stock would be trading in the lower $30 per share range (~11% higher). Regulatory concerns always need to be factored in when evaluating large financial institutions, and this includes BAC. I believe that the regulatory environment is actually improving, but this could change in short order. From a macro standpoint, a deteriorating economy would eventually negatively impact the banking sector. Currently, there are some headwinds, but in my opinion, a recession is not in the cards in the near future. No one should be surprised by the fact that Warren Buffett is a big fan of BAC given the bank’s strong earnings profile and promising dividend growth prospects. 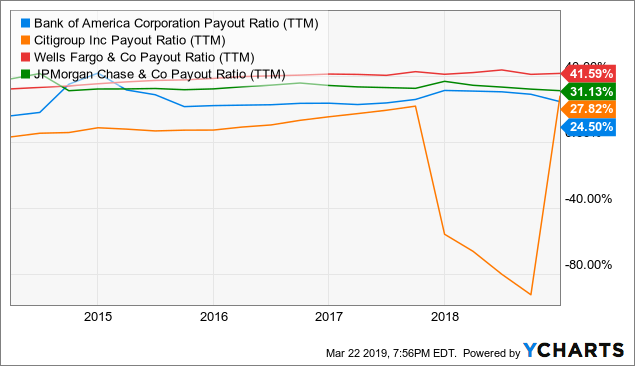 This bank is a legitimate income play that has reported impressive earnings growth over the last five years, and it helps the bull case that BAC shares are trading at an attractive valuation. I believe that BAC’s stock will be a market beater over the next 18-24 months, so investors with a time horizon longer than the next few quarters should treat any significant pullbacks, especially if they are caused by broader market concerns, as long-term buying opportunities. Author’s Note: Bank Of America is my largest holding in the R.I.P. Portfolio and I have no plans to reduce my position in the near future. Disclaimer: This article is not a recommendation to buy or sell any stock mentioned. These are only my personal opinions. Every investor must do his/her own due diligence before making any investment decision. Disclosure: I am/we are long BAC, C. I wrote this article myself, and it expresses my own opinions. I am not receiving compensation for it (other than from Seeking Alpha). I have no business relationship with any company whose stock is mentioned in this article.